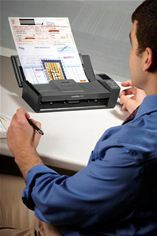 June 12, 2012 - Kodak today announces the launch of its latest innovation in desktop document capture - the KODAK SCANMATE i940 Scanner. Powerful, portable and productive, the compact cloud-connected scanner quickly and simply converts paper documents into dynamic digital files for distribution and sharing. Easy-to-use features make it a perfect fit for the business professional in the office or on the go. With speeds of up to 20 pages per minute (in double sided scanning 40 images per minute), and resolutions of up to 600 dpi, it reliably captures documents in colour, grayscale or black & white. A high-capacity automatic document feeder can handle a wide variety of media between DIN-A4 and business cards and features an exclusive hard card feeder. The i940, an evolution of the award-winning KODAK SCANMATE i920 Scanner, includes both TWAIN and ISIS driver compatibility for easy setup and integration with users’ existing systems and software programs. The new USB-powered feature extends the i940’s mobility by allowing users to power the scanner solely via the USB port on their computer. Later in 2012, the i940M Scanner will debut as the first KODAK Scanner to offer MAC OS compatibility. Users of the i940 can upload scanned documents to the cloud through new connectivity to EVERNOTE, BOX.NET, GO-DOCS, and MICROSOFT SHAREPOINT Server to improve teamwork, and sharing of documents with colleagues or customers. Kodak’s Smart Touch functionality delivers ease of use and greater productivity to the initial point of capture with one-button file distribution. Smart Touch allows users to move files, such as JPEG, TIFF, Word and single- or multi-page searchable PDFs, directly into email, MICROSOFT SHAREPOINT or Cloud Servers, networked folders and other software applications. Kodak’s Perfect Page Technology provides built-in image enhancement tools that result in high quality images with crisp text and bright colours. Even the most challenging and mixed document types, can be scanned without the need to change the scanner settings. Images from a variety of documents and media are adjusted and treated with a number of advanced features, including deskew, image rotation, content-based blank page removal, electronic colour dropout and automatic brightness and contrast to improve the readability. The i940 Scanner, priced at €420 includes Presto Business card management software and a three-year next business day, advance unit replacement warranty. To learn more about the KODAK SCANMATE i940 Scanner, visit www.kodak.com/go/i940.